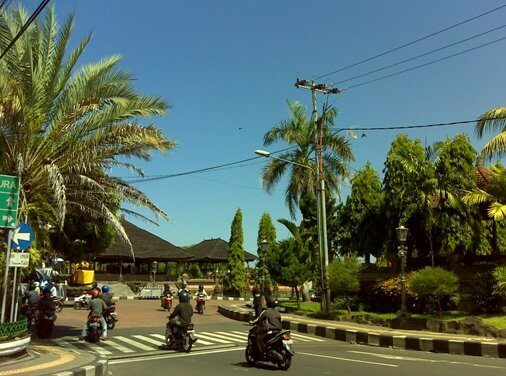 Kerta Gosa is a historical building, located in the heart of Semarapura Town, Klungkung Regency, Bali. 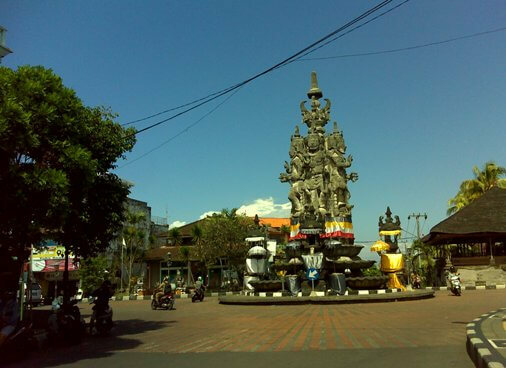 Several important buildings are located around Kerta Gosa include The Statue of Kanda Pat Sari (catus patha), Bale Kambang, Monument Puputan Klungkung, Museum Semara Jaya, Puri Agung Semarapura and others. Kerta Gosa is an open building feature with a square pyramid roof, roofed with strong palm fibers as typical Balinese buildings, and is part of Puri Semarapura. Kerta Gosa and the surrounding region have created a synergy, unique, and awesome beauty. In Kerta Gosa building complex there are features include Bale Kerta Gosa, Bale Kambang and Taman Gili (water garden with lotus and surrounds the Bale Kambang). The beauty can be seen from the architectural styles of the buildings and the arrangement of the landscape. 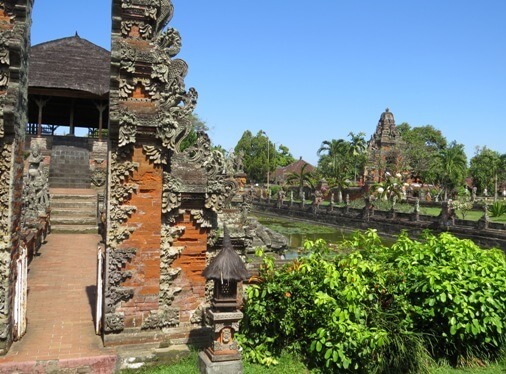 Kerta Gosa in the past have important functions including: (1) as the place of the court where the king was supreme judge; (2) a meeting place for kings in Bali; and (3) a place to carry out the tooth filing ceremony for the sons and daughters of the King. The uniqueness of Bale Kerta Gosa and Bale Kambang lies in the ornate of traditional paintings that covered the ceiling. This is a classical puppet painting of Kamasan style. The making is centered on the village of Kamasan, in the south of Semarapura. The painting is also commonly found in the shrine or temple, usually contain elements of art and philosophical meaning drawn from the epic of Ramayana and Mahabharata. Level-1, the very bottom level and is part of the story of Tantri Kandaka. Tantri Kandaka tells of a king who always wanted to marry the virgin girl every night and a patih daughter, Ni Diah Tantri who is compassionate and intelligent girl. Thanks to the intelligence and knowledge she learned, Ni Diah Tantri managed to resuscitate the King out of his misbehavior to the pleasure of lust. Level-2 & 3, is part of the story of Bhima Swarga, where Bhima went to Yamaloka to saving his parent spirit. His trip is followed by Kunti and his brother the Panca Pandavas. In Yamaloka they encounter a variety of events experienced by the spirits according to their deeds in the world. Bhima finally managed to find the spirit of his father and mother, but he must obtain the Tirta Amertha so the spirits can reach heaven. Level-4, is part of the story of Garuda seeking the Tirtha Amertha. This story illustrates the Garuda devotion to his mother. Knowing his mother is being captive by the serpents, Garuda tried to save her. But to freeing his mother, the serpents asked Garuda to obtain Tirtha Amerta in the kingdom of Gods. The war with the Gods ensued and finally Garuda managed to get Tirtha Amerta. Lord Vishnu come off and gives the Garuda tactics in order to save his mother and Amertha does not fall into the hands of the Snake. Garuda succeeded in saving his mother, while the snakes do not get Amerta and became the eternal enemy of Garuda. Because of the devotion and courage, Garuda agree to become the mounts of Wisnu and an ally of the Gods. Level-5, is part of the Palelindon. This section (Palelindon) describes the forecast and the meaning of the earthquake that occurred. Forecast can mean good or bad, depending on the time of the earthquake that occurred. Level-6 & 7, is part of the story of Bhima seeking Tirtha Amrita. The fight between Bhima with the Gods occurred. Finally Bhima together Sang Hyang Bayu and his "punakawan" (underlings), Twalen and Mredah, successfully facing Sang Hyang Tunggal. Sang Hyang Tunggal endows the Tirta Amertha to Bhima, so he managed to save the spirit of his parent to reach heaven. Level-8, is describe the three (3) features of Meru and one (1) feature of Padma Anglayang, with a different name. This illustrates the spirit of the ancestors of a certain group (soroh or catur warna), when it reaches heaven will occupy Meru in a particular direction, while the Padma Anglayang for Brahmana. It can also be interpreted as a reminder and devotion of the descendants to the ancestors who had been in heaven, venerate them according to their respective shrines. Level-9, is describing the gods who keep the balance of the world in the four directions of the compass. Level 1, is the very bottom, telling about Palelintang. Palelintang is associated with the effect of the arrangement of stars in the sky to the human characters that were born on earth. Level 2, is a special story related to people's social life and the struggle in support of children, where the Brayut family is the main story in this section. The story illustrates the struggle of Men Brayut and Pan Brayut in support his family, which is blessed with 18 children. The difficulties of life had to pass as the fulfillment of basic needs to the problems of married life. When Men Brayut breastfeeding her two children, the other trying to get her attention by playing her hair, fighting, or making a mess. Pan Brayut was told have no free time. In addition participate to caring for their children, Pan Brayut also become the pillar of family life and must prepare all the rituals for ancestors. Thanks to hard work, perseverance and compassion of Men Brayut and Pan Brayut, all children can grow up and be successful. Difficulties of life they feel ultimately become a joy. Pan Brayut and Men Brayut finally decided to live their old age in the Spiritual or Meditation. Level-3,4,5 & 6, is illustrate the journey of Prince Sutasoma. The story itself is rooted from the Jataka Stories and the ancient Javanese texts (in the form of kakawin) composed by Mpu Tantular. Told that Sutasoma is a gentle, wise and compassionate prince. One day, Sutasoma left the palace heading into the forest. His trip continued until he met three wild creatures: the giant with elephant-headed, the serpent, and the tigress. This wild creature is intending to take Sutasoma’s life for their own reasons, but finally realized and become disciples of the Sutasoma. In the end the Sutasoma have to deal with Kalmasapada, a giant. Kalmasapada originally was a king, the son of a good king, Sadasa. Kalmasapada has evil characters and had made a vow to gather 100 princes for submission to the Lord Kala. Sutasoma was captured by Kalmasapada and continued until both of them involved in moral arguments. Sutasoma, a wise and compassionate being has managed to make Kalmasapada conscious. All princes are released and he becomes a follower Sutasoma. Sutasoma also help to improve Kalmasapada's way of life until finally returned to rule in his Kingdom. 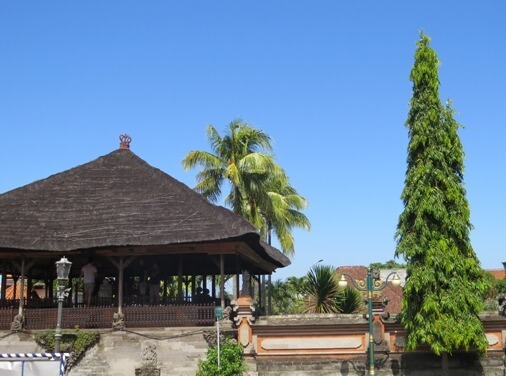 Puri Agung Semarapura or Klungkung Palace, a historic building complex, was established in 1686 by I Dewa Agung Jambe, who is a descendant of King Gelgel. Furthermore, at the end of the 18th century, Kerta Gosa was established in the northeastern corner of the palace complex or Puri Agung Semarapura. Kamasan paintings in the Kerta Gosa ceiling probably originated in the mid-19th century, and renewed in 1918, 1938 and 1963, with individual panels were repaired in the 1980s and 1990s. The first ruler in Puri Agung Semara Pura was Dewa Agung Jambe I (1686-1722). The government is continued by his descendants, until the Dutch intervened in 1849 to the territory of the Kingdom of Klungkung. The queen Dewa Agung Istri Kanya who ruled at the time has managed to stop the Dutch attack in Kusamba. It ends with the reconciliation between the king in Bali and Dutch authorities. Dutch intervention in 1908 was the last in Bali, after previous interventions in 1906. The king who ruled at the time was Dewa Agung Jambe II (1903-1908). The intervention (in 1908) was triggered by Balinese revolt against a Dutch attempt to impose an opium monopoly in their favor. Dutch sent troops to crush the rebels, killing 100 Balinese in Gelgel. The king left the palace in Gelgel towards Klungkung, followed by Dutch attack to the city of Klungkung. On 28 April 1908 the final confrontation, Dewa Agung Jambe II along with about 200 followers, came out from the palace and resist. Finally, The King and fighters including the women and children involved in the ritual of Puputan. After Puputan, the surviving members of royal family were exiled. In 1929, the royal family was allowed to return and settle in Puri Agung, which is newly built. The puputan event is still remembered, on 28 April 1992 the Puputan Klungkung Monument and Semarajaya Museum was inaugurated. 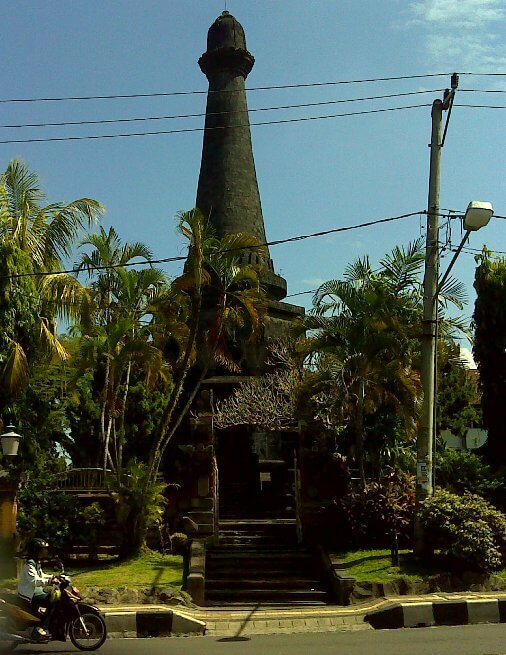 The Puputan Klungkung Monument stands firmly, made of black stone, shaped Lingga-Yoni with a height of 28 meters and was built on a land area of 128 square meters. While the museum itself was originally the MULO (secondary schools in the Dutch colonial era). In this museum visitors can enjoy the pre-historic objects, craft objects and historical objects including photo documentation of the descendants of King of Klungkung.